Here is a quick guide for an easy set-up of your account on Fingage Platform. 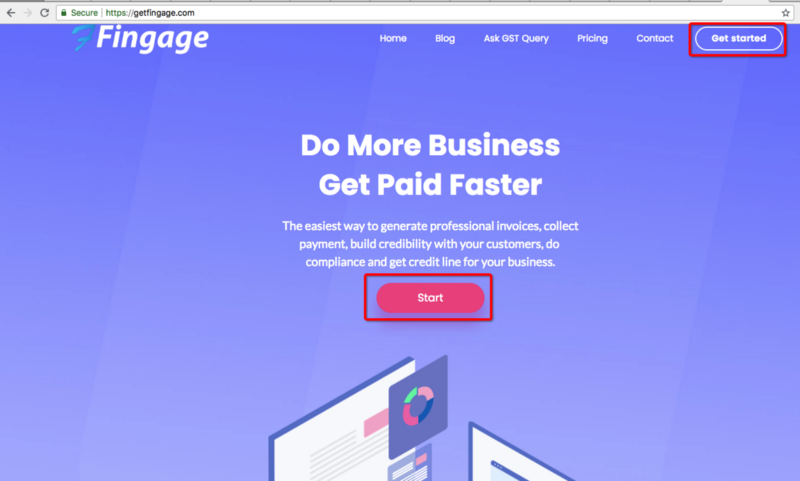 Fingage provides the easiest way to generate professional invoices, collect payment, build credibility with your customers, do tax filings and get a credit line for your business. 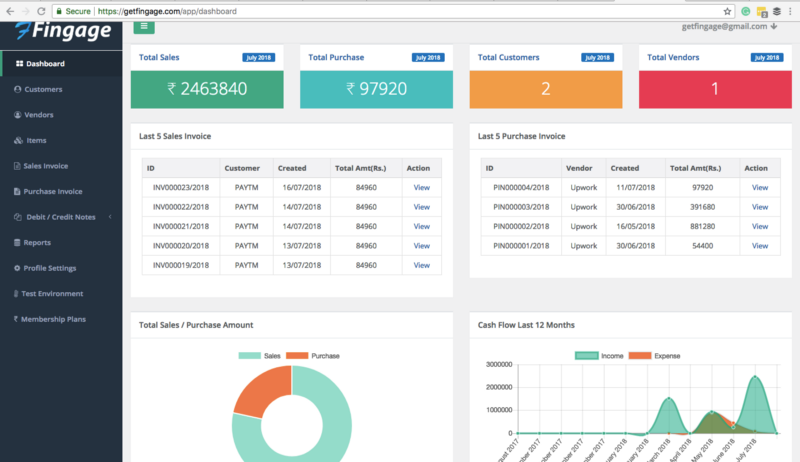 It provides a single dashboard view for all your financial transactions, a bird’s eye view of your cash flow and real-time notifications on upcoming filings required under law. Visit our application at https://getfingage.com/ and navigate to “Get Started” or “Started”. Once you do that, our system will redirect you to our sign-up page. If you have a Gmail account you can quickly sign-in with your Gmail account credentials. If you operate outside Gmail, no worries you can sign-up with your email account and validate your email account. Fingage is a multi-business, multi-user platform and user can define multiple businesses, and share control based access to multiple users. These users could be the book-keepers or team members within a business. 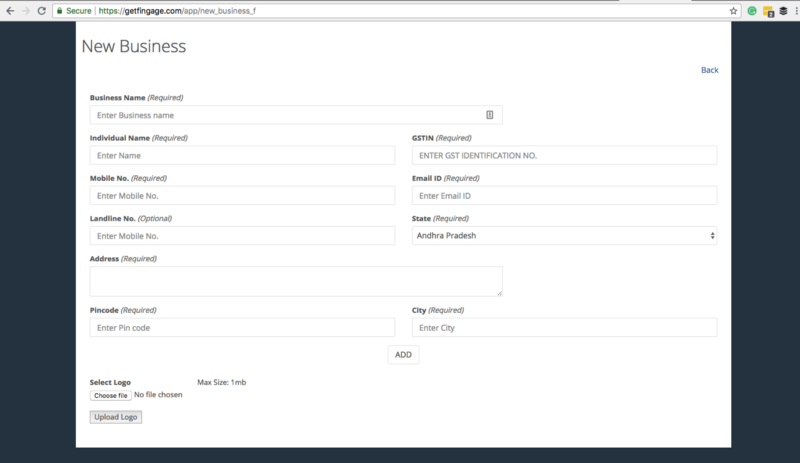 However, it is important to note that you sign-up as an Admin user for the first time when you are setting up your business. As soon as you complete the sign-up, our platform will ask your “User Type”, you may select “Admin” as a first time user. Once you log in as an “Admin” user, the system will ask you to set-up your business. Please note it is not necessary for your business to be registered under the GST or Shop Act. If you are an unregistered business or a freelancer, you can simply set-up your business with a trade name of your choice. Our system will treat this business as a sole-proprietorship business and accordingly your compliance will be followed. Once you do that, voila, you are now all set to launch your business dashboard. Start creating beautiful and intuitive invoices and share these invoices with your clients on the go. Still doubtful? We will just say that if you were able to sign-up for Facebook and using it to socialize, you shall be able to use our platform too. We are aiming to make it as simple yet useful possible. And we’re all ears for your queries and doubts. Write to us at [email protected] and you’ll have an instant support from our super-excited customer support.